Do you enjoy baking? Are you the go-to person for the school or local non-profit organizations' cookie-sale fundraiser? Do you binge watch baking competitions on TV wishing you could compete to earn the grand prize to open your own bakery? Then you might want to consider profiting from your ability to bake yummy treats. Baked goods businesses have grown in popularity over the last few years, but actually, they've been around for awhile. Mrs. Fields started selling her decadent cookies in the 1970s. More recently, many entrepreneurs have started selling their cupcakes from home and have grown into regular retail bakeries and even franchises. Starting a home-based bakery might sound fun and easy to do – after all, you're already baking. But there are a few cons to running a home-based baking business that you'll need to consider before baking your first batch of goodies. Here are an overview and a few resources on how to turn your love of baking into a home business. Do what you love, assuming you love baking. Creative expression. Perhaps you put a unique twist on your baked goods. Easy to start. You already have a kitchen and knowledge of cooking. There's always a market for yummy baked goods. Can sell locally and/or online (depending on your baked good's ability to be delivered or shipped). Foodservice business is usually regulated by your state's occupational or health department, so you'll need to find out your state's laws regarding the sale of food items baked from home. Most states require that your baking equipment (i.e. mixers and spoons) and supplies (i.e. flour) be separate from your personal cooking use. In some cases, you'll need a separate kitchen. However, some states allow you to use your personal kitchen, but you'll still need separate equipment and supplies. You only earn money when you sell baked items, which means you can spend a great deal of time cooking in order to create enough goods to sell to meet your income goals. While your family may love your cooking, your customers may not. Competition might be tough and you'll need to know how to stand out in the crowd. If you are successful, it's likely that you'll outgrow your home kitchen. Sufficient skill and knowledge of safe food preparation and potential dietary issues. For example, you'll want to disclose if you have peanuts in your kitchen to warn consumers who are allergic to the nut. A retail or food service background would be helpful. A supply of ingredients plus room to store them, a regular shopping regimen, and good suppliers. Remember, you may need to store your equipment and ingredients separately from your personal ones. Any licenses or inspections required by your state, county and/or city. A health inspector may visit your home. An understanding of your competition and how your baked goods will stand out in the crowd. 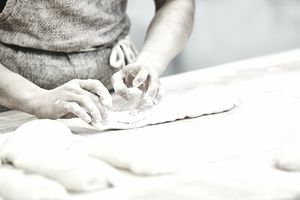 If you're ready to start baking up profits, here are the steps to launching your home based baking business. Find out the laws and regulations of your state regarding food service businesses. Obtain needed licenses and permits to start your business. Your city or county government officials will have this information. You might be able to get the details you need and file for your license online. Contact your state's tax or comptroller's office about whether or not you need to collect sales tax on your food items. Often times, you can get your sales tax permit online.They're usually free, but require you to pay the sales tax monthly or sometimes quarterly, on the items you sell. Create an LLC or other business entity (not a sole proprietorship) to best protect your personal assets from a lawsuit if someone should get sick or have problems with your food items. If you have a partner in your venture, you'll want to set up a partnership. Decide what types of baked goods to sell. Starting out, it will be easiest to focus on one or two items, such as bread or cookies. As you settle into your business, learn what's profitable, and what your customers like, you can expand your menu. Also, consider what will make your baked goods stand out. For example, are they made from all organic ingredients? Are they gluten-free? Purchase separate cooking equipment and supplies. This is probably a requirement in your state, but also helpful in keeping your personal and business separate, including the expenses for home business tax purposes. Order packaging and labels for your goods. You maybe be able to avoid paying sales tax on these items if you have a sales tax permit (#3). Sell your treats. Create a marketing plan on how you'll find and reach your market. Ideas include taking them to your farmer's market, sell them online (depending on the product) and/or consign them in local cafes, restaurants and other shops that sell food. You might consider starting a food blog to help promote your product, plus it can become an additional source of income.